I don't even know what those hyphens are supposed to be for, OR whether or not you should use the elevator. Maybe it's a trick to improve the gene pool while denying liability. Somebody I don't know sent this from a phone. I find this one particularly funny. 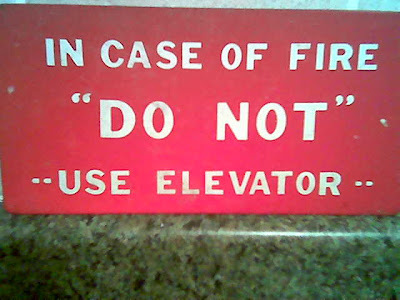 There's gotta be that moment that people are thinking "Wait- so that means I SHOULD use the elevator then..."
yep that's right..they'll be standing on the burning deck debating the pros and cons...now i'm wondering what the label onthe fire escape says. This one must have been posted by someone who is really worried about the possibility of over-crowding in the stairwells in the event of an emergency. Plus, it has the added bonus of wiping out all the people who are smarter than the sign maker, rendering him/her possibly above average for a change.